I've eaten here twice in the last month, and what a pleasant surprise it is. You go in and see it is VERY popular, which is not always a good thing as a packed pub often leads to lengthy waits for food and drink, but not here. On one occasion the sun was shining and our party of half a dozen or so sat in the garden. We had paid individually at the bar for our drinks, and selected and paid for our food, and our orders were processed with the minimum of fuss and the greatest of efficiency. It was very busy which was a concern when on a limited time lunch break from work, but we needn't have worried. We all had our food served, piping hot and delicious within about 5 minutes. Great traditional English pub with proper pub food and great beer from Shepherd Neame located on the river Mole in a characterful building dating back to 1403 and once frequented by Elizabeth I (apparently). The landlord, landlady and staff are very friendly and welcoming. We have a dog and he was made very welcome with the landlady giving him tidbits from the Sunday roast. Every visit is a pleasure. Outstanding beer and lager, friendly and helpful staff, stimulating conversation with The Landlord, and the patrons. The Running Horse is furlongs ahead of the competition. A unique, great value for money, special public house. Regular visits are recommended. And strangely, the more you eat and drink, the better the experience becomes. I love this pub, traditional style, good food and fabulous beers. 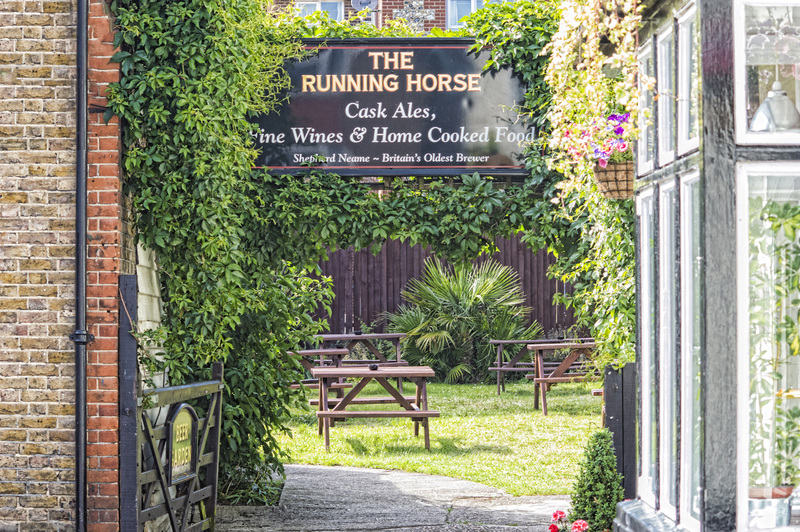 Beautifully kept, old fashioned pub with excellent and friendly staff.